Ice Is Nice, But Do I Have To Say Venti To Get A Large Coffee? A woman is suing Starbucks for putting too much ice in her iced coffee. NPR's Lynn Neary wonders if asking the barista for light ice could fix things, then decries the Starbucks' naming conventions. How much ice is just right, legally? How do you like your coffee? Black with sugar? Lots of milk, no sugar? Hazelnut flavored? Not so much? Well, how about your iced coffee? Me, I like it with a lot of ice ... can't stand it when a barista drops a few measly ice cubes into my cup, which melt before I have even finished drinking the coffee. Make that drink really cold, I say. Give me some ice to chew on now. 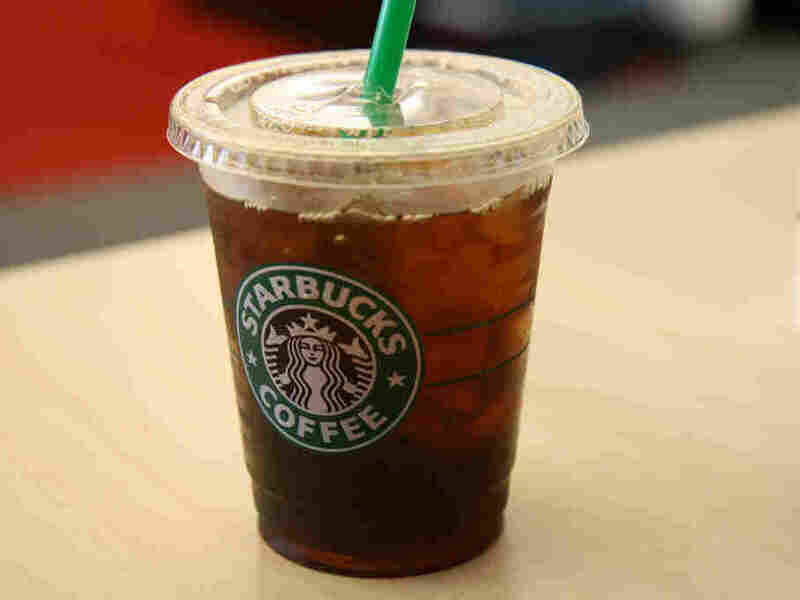 So I was doubly perplexed when I heard that a woman named Stacy Pincus has filed a class-action suit against Starbucks claiming the coffee chain is cheating customers by putting too much ice in their iced coffee. Perplexed first because of my aformentioned preference for extra icy drinks, and second, because, well because, this is ridiculous isn't it? Are we such ineffective communicators these days that we can't just say, "Not too much ice please. Thanks so much, I appreciate that." Or in Starbucks lingo, "light ice, please." Last time I looked the Starbucks baristas were human beings who might just be won over by a polite request accompanied by a smile. But then I started to wonder, could this excessive ice thing be considered non-functional slack fill? Don't know what that means? Let me explain. There's a law that regulates how empty space can fill out a product package and it's at the center of a class action suit against the McCormick spice company. You see, McCormick is selling 3 ounces of pepper and one ounce of air in a package that used to hold 4 full ounces of pepper. You're not allowed to do that under the non-functional slack fill law. So that complaint has a little more cred in my book. After all, I have gotten pretty annoyed a few times when I have opened a bag of potato chips only to discover it is half empty. But as it turns out, that offense is not covered by the law. That slack space is functional — it helps to keep the chips from getting crushed. Confused? Well, that's the law for you. But back to Starbucks for a moment. I have a much better idea for a class-action suit. I've been buying coffee there for a pretty long time and every time I have to ask for venti anything it just doesn't feel right. It's embarrassing and causes me emotional distress. I just want to got back to good old small, medium, and large. What's so hard about that? I'm pretty sure I have a lawsuit here. Any lawyers out there? What do you think? There could be some money in it for you.